I was chatting to someone who had a Pisco Sour cocktail on holiday, and he was so taken with the drink that he purchased the necessary ingredients to recreate it at home. The result was quite disappointing, as the drink didn’t deliver the same sensation as experienced on his travels. This suggests that the whole sipping experience is influenced by context; where you are, your surroundings, who you are with, and the sense of occasion. We’re all aware that a lovely refreshing drink tastes far better if sipped in warm sunny weather by a poolside, and our sense of smell, taste and connection with time and place is strong enough to recall pleasant memories. I like to collect tastes which have a relevance to place. For example in Croatia I purchased a bottle of lavender liqueur which captured the smells and tastes of the lavender fields which Croatia has ideal growing conditions. A friend gave me a gift of birch liqueur from Iceland; the bottle actually contained a birch twig. I love woody/resin tastes, so it was definitely well received and evoked a wooded area, reflecting the trees that grow well in Iceland’s climate. This sense of place was my intention when I began making Kirkton Liqueurs. I wanted to capture the sense of surroundings on the West Coast of Scotland. Walks at various times of the year highlight the berries & blossom which grow in abundance in the surrounding landscape. If I could capture the essence of a place how would I do it? 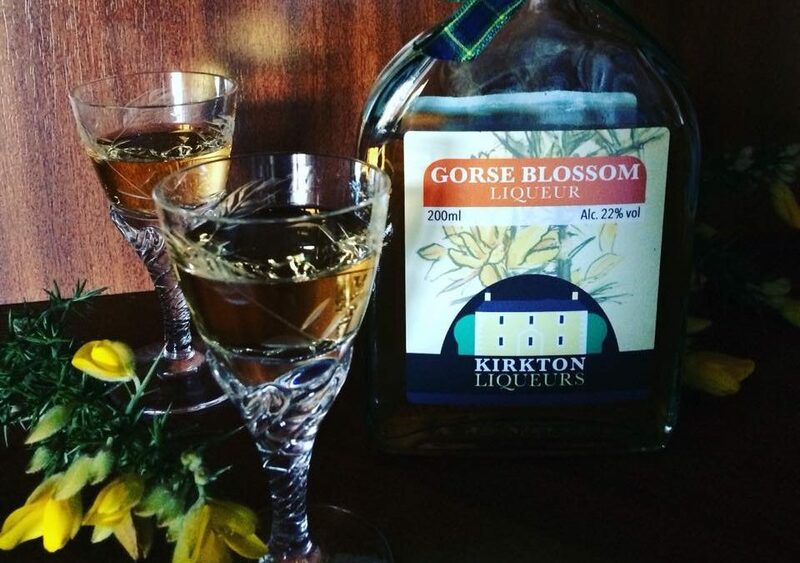 The gorse Blossom Liqueur is a direct result from an attempt to harvest the aroma of warmed blossom. The spirit base of the liqueur is produced at Strathleven Distillery by Ricky Christie, a skilled distiller who has the art form in his genetic makeup (his father was a distiller before him). The fine vodka base is produced from Scottish Barley Grain and is distilled five times making it an exceptionally fine base to have flavours infused. The discerning palette can detect the barley grain base, and I think that it’s for this reason that whisky drinkers are more likely to warm to the fresh fragrant flavours of gorse blossom liqueur. The taste is surprising on first trying. It has a totally different flavour profile to berry based liqueurs and there is very little to compare it with. Hints of coconut, vanilla, custard cream, honey even banana have been suggested. Whatever the response to Gorse Blossom Liqueur in particular, I like to think that it captures a little of the Scottish West Coast. In essence, it captures the spirit of place in a bottle.